Hi there! I hope you are enjoying the Sleep, Baby, Sleep® site! If you have already looked through the site, and are still having trouble getting your baby to sleep, then perhaps an individual email consultation would be best. Having a baby sleep consultant guide you and answer all of your questions, will ensure that your baby is getting the sleep that he/she needs. The consultations and sleep plans are always completely personalized for your baby’s unique situation. I believe that there’s no “one size fits all” advice, when it comes to helping a baby sleep. That is why I became a sleep consultant and offer personal consultations. When my baby wasn’t sleeping, despite the massive amount of information on the web, there was nowhere I could turn that would provide guidance based on my baby’s specific situation. As a baby sleep consultant I take into consideration your baby’s age, sleep history, temperament, and individual circumstances. In other words, I get to know you and your baby before I give you any advice. Complete assessment of your baby’s sleep. Personalized step by step sleep plan. 3 weeks of unlimited email support. Survival guide for bumps in the road. 2 weeks of unlimited email support. 1 week of unlimited email support. 2 emails for follow up support. 45 minute online chat session. Full transcript of conversation emailed within 24hrs. I love helping sleepless parents, sleep topics are my passion. To read more about me and how I started this site, you can read my candid Biography Here . You can also see what others are saying about how I have helped their little ones sleep. You might find some stories similar to yours. Here are some recent Success Stories. Frequent night wakings. After I collect your baby’s sleep history, I will determine why your baby is waking frequently and we can begin working on fixing those wakings right away. Eliminating props. If your baby needs to be rocked, nursed, or bounced to sleep, and wakes several times a night expecting the same, I will create a step by step sleep plan of how to teach your baby to fall asleep on his/her own so that he/she is not reliant on you to sleep well. Night weaning. I will help you determine which feedings your baby still needs at night (if any), and work on which ones he/she is using for comfort. I would never ask you to eliminate all night time feedings, unless your baby was ready. We will work closely together to determine this, so that you are responding to his/her wakings appropriately. Not responding appropriately to the middle of the night wakings is the #1 reason sleep training fails for most parents. All sleep plans also come with a hunger vs comfort chart that you can use as a guide. Sleep schedules. Making sure your baby is following an age appropriate sleep schedule is an important component of helping your baby sleep well. We will discuss how much sleep your baby should be getting, how many naps and how long, and how long your baby should be awake in between sleep times. Most importantly we will work together to make sure your baby’s sleep is distributed appropriately and that he/she is meeting his/her daily sleep requirements. Nap troubles. Babies that have bad sleep habits, often nap poorly and only for about 30-40 minutes. They need to be rocked, fed, or even need a car ride or stroller just to nap. I will show you how you can improve your baby’s nap length and quality. Pacifier dependency. Does your baby need a pacifier to sleep? Are up all night replacing it? My techniques will help decrease your baby’s dependency on the pacifier so that he/she doesn’t wake and cry when it falls out. There are so many benefits to pacifiers, getting rid of it is not the only option. Unless that is what you would like to do, then we can work on saying bye bye to the binky for good! Early morning wakings. When a baby starts waking very early, these wakings can be persistent and difficult to resolve. I will help you work on re-setting your baby’s internal clock so that he or she can start waking at a more reasonable time. Sleep Regressions. Sleep regressions are very complex and many times parents offer extra comfort, feedings, and revert to old sleep habits just to get through the regression. I will help your baby get back on track while considering the developmental milestones your baby is going through at the time. There is no reason to put off teaching your baby good sleep habits because of a sleep regression. You just have to figure it into the sleep training plan. And much more! Every baby is different, and has a unique sleep story. I can’t wait to hear all about your baby and help him/ her finally start getting the sleep that a growing baby needs. Upon payment of your chosen package, you will receive a welcome email from me with an assessment form. You can tell me all about your baby and his/her sleep problems, and I will email you back the same day. I will discuss with you the reasons I think your baby is not sleeping and outline a step by step plan, so that you and your family can start enjoying some more Zzz’s right away. In addition to your plan you will receive charts that will help guide you now and in the future, when your baby’s sleep requirements change. You will also receive a “survival guide” for bumps in the road such regressions, illness, travel, separation anxiety and teething, so that you know exactly how to handle these situations when they come up. I am a baby and toddler sleep consultant, so I primarily work with children ages newborn to 4 years old. Below are my sleep packages. Keep in mind that for the individual email packages, I don’t charge for emails you send to me. I also never charge for clarifications. If I need to ask more questions so I can strategize a plan, that clarification email does not count towards your package. Neither do emails where I high five you, for a job well done! The prices are listed in USD, but I work with clients all over the world so any currency can be used for payment. Paypal will automatically convert it. Complete assessment and identification of your child’s sleep needs and troubles. Personalized, step by step sleep plan. Unlimited emails for two weeks for a fully personalized consultation. 2 phone calls per week for two weeks. Unlimited text messaging support. Yes, even on weekends and holidays! 2 follow up email consultations that do not expire so you can use them at anytime for on-going support. Your 2 week subscription begins on the day you receive the customized sleep plan, or your chosen start date. Unlimited emails for three weeks for a fully personalized consultation. I will be an email away to answer all of your questions. Your 3 week subscription begins on the day you receive the customized sleep plan, or your chosen start date. Unlimited emails for Two weeks for a fully personalized consultation. I will be an email away to answer all of your questions. Your 2 week subscription begins on the day you receive the customized sleep plan, or your chosen date. The Unlimited 7 Day Package. You will receive a personalized sleep plan specific for your baby, and 7 days of unlimited email support. You also have the option to add-on follow up emails with this package. Unlimited emails for One week for a fully personalized consultation. I will be an email away to answer all of your questions. Your 7 day subscription begins on the day you receive the customized sleep plan, or your chosen date. The 3 Email Package. 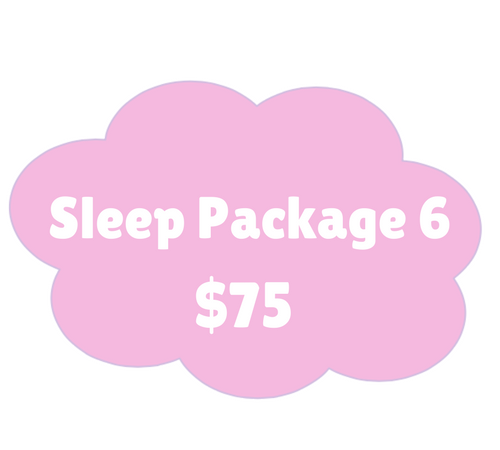 This package includes a customized sleep plan, created specifically for your baby. In addition to the sleep plan you will get two additional follow-up emails for questions, support, or to fine tune your sleep plan. You will also receive a survival guide for bumps in the road. You can use your 3 email subscription at any time, there is no expiration date. The Chat Package. This is a basic chat session package and is appropriate for parents that don’t require that much help, but still have a few issues they are struggling with. Maybe your baby has already been sleeping through the night, but now something has changed. Perhaps you have done a lot of research, but just don’t know how to piece it all together. All of your questions will be answered in this 45 minute online chat session. Upon payment you will be given a link to a chat room, where you can get all of your questions answered by yours truly. After the chat a transcript of our conversation will be emailed to you so that you can have for reference. Email me for the date and time you have in mind, and we can get started. If you need help right away, I am usually available the same day. Failed attempts are extremely rare. This can be attributed to the fact that the consultation is personalized for your baby and based on how he/she is responding to the sleep plan. Most parents that have tried sleep teaching will tell me that they have been unsuccessful with a certain method. The “method” is only a small part of the equation. I like to look at sleep training as a big puzzle, with just one piece missing it will not work. That is exactly why I offer personal consultations, to make sure all of the puzzle pieces are in place and that variables are handled appropriately by an expert. As a result Sleep, Baby, Sleep has a nearly 100% success rate, so you can purchase with confidence! Not sure if purchasing a consultation package or hiring a baby sleep consultant would be a good fit for your family? Email Me so we can decide together.